Shakespeare’s Curtain theatre is a major discovery. Immortalised in Henry V as ‘this wooden O’, it was here that Romeo and Juliet’s star-crossed love first played out. As well as premiering these masterpieces, all the signs point to the Curtain being the best preserved of Shakespeare’s playhouses. With its gravelled yard, knucklebone floor and surviving walling, the Curtain promises dramatic new insights into how Elizabethan plays were staged. 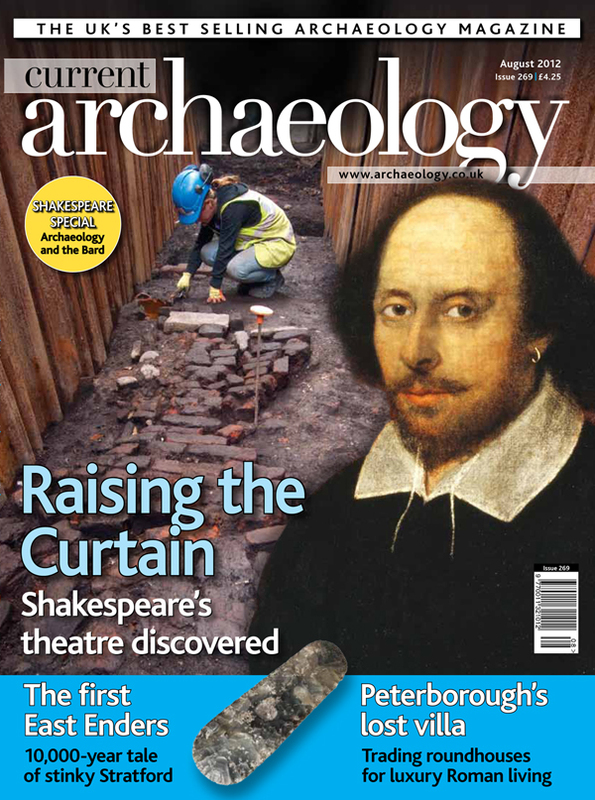 As well as bringing you the latest from the theatre site, we explore attitudes to archaeology in Shakespeare’s day. His playwriting career coincides with the first stirrings of British antiquarianism. Contemporary perceptions fed into his works, colouring some of his best loved plays and reflecting a country coming to terms with its past. Sporting feats will dominate our screens this summer, but one early outcome of the regeneration of the Olympic Park’s Stratford site is the archaeology. Excavations across an area the size of the City of London revealed 10,000 years of human activity on the site, and a glimpse into the lives of the first East Enders. More modest building projects also provide spectacular discoveries. Redevelopment of an allotment near Peterborough produced a completely unsuspected Roman villa. Lying on the site of an Iron Age enclosure, it provides tantalising hints of Britons being seduced by the conquerors’ Classical lifestyle. Finally we examine the fall and rise of Merton Priory. Once a rival to Westminster Abbey, the priory met an ignominious end during the Dissolution, when its fabric was recycled in Nonsuch Palace. Now, in a triumph for local archaeology, the site is in its ascendancy once more. Despite staging some of the Bard’s most famous plays, the Curtain Theatre faded into obscurity in the 17th century and was lost. Now Museum of London archaeologists have found it once more. As Shakespeare’s star rose, so too did the first stirrings of antiquarianism. What can we learn about this brave new world? Archaeological gold: preparations for the 2012 games have uncovered 10,000 finds spanning 10,000 years. A routine watching brief revealed a completely unsuspected Roman villa and tantalising hints of continuity with an Iron Age predecessor. The myth of a Golden Age of archaeology?